This is an injury to the neck that occurs when your head is suddenly and unexpectedly jolted backwards and forwards in a 'whip-like' movement. This can cause your neck muscles and ligaments (the soft tissues) to stretch more than usual, resulting in a strain. Whiplash injuries can commonly occur after car accidents, especially those involving rear-end collisions. Whiplash-type neck strains can also occur with everyday activities such as jarring your neck if you trip or fall, or whilst doing exercise or sport. I once knew of a person who sustained a whiplash injury whilst water-skiing. At great speed, he suddenly lost his balance and fell. As his chin hit the water, his head was suddenly and forcefully jolted backwards. 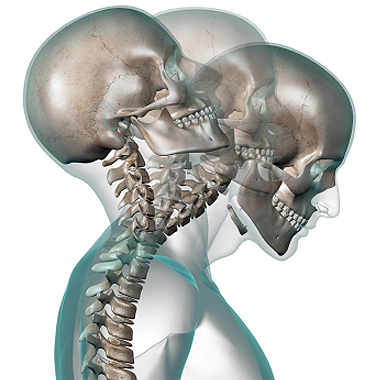 A whiplash disorder, depending on its severity, can affect various structures within the neck, upper back and spine. This is why your pain can feel quite intense. Whiplash is therefore characterised by, and associated with, a collection of different symptoms that are experienced following this type of injury. The main symptoms of whiplash are headaches, neck pain, muscle spasm and joint stiffness. The important thing to remember is that your symptoms will settle in time. Physiotherapy will not only help to alleviate your pain and symptoms from whiplash, but will also facilitate your body's natural healing process and prevent secondary problems from occurring. We will use a combination of tailor made treatment techniques to make it more comfortable for you to move, relax and sleep after such an injury. We will assess you and guide you through the appropriate level of activity and exercises throughout your treatment. We will also advise you on what you can do throughout your day to help ease your symptoms.